September 23, 2013 - Tokyo, Japan - After several years spent with an identity crisis, Luigi Mario, brother to famed plumber Mario Mario, and part of the legendary duo "The Super Mario Bros." has announced he will be resigning from the family business. Having begun to question the lack of similarity between the brothers, late last year Luigi insisted on a DNA test. "For about 10 years I'd been wondering if I was adopted," Luigi spoke in a press conference early Monday morning, "Unfortunately when we were in our 20's our [Mario and Luigi's] parents were killed by a fire flower growing out of their upstairs toilet, so I never had the opportunity to talk with them about it. All these years I've been following in the tool belt of a man who wasn't really my father." 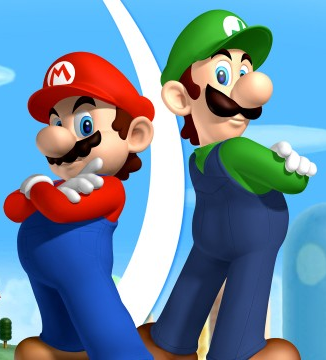 "I love my brother, but we're known as the Super Mario Bros. People have always assumed he was getting top billing, never realizing that it had to mean it was our last name. Not that I resent my brother's fame, it's just hard to grow as a person under that shadow." Luigi Mario closed the conference by expressing his desire to find his real parents and to hint at what he might be doing next. "I want to dance," Luigi stated, "God gave me the gift of rhythm. It's about time I put it to use." Will Mario continue to plumb? Are his days of Go-Kart racing over? No one can ever truly leave Go-Kart racing behind them. I thought he started a ghostbusting business. This made me laugh out loud. I liked this post very much.